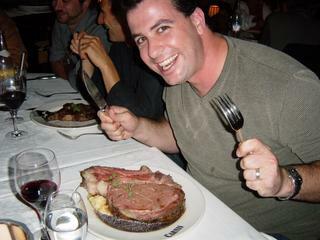 I feel compelled to share this image of Bret Mogilefsky avec boeuf. We ended up eating an even more amazing meal last night at… La Queue de Cheval. It seems to be quite a popular place. The highlight of the evening for me was a bottle of fabulous Sauterne ordered by Martin Tremblay – I believe it was a 1990 – that married exceptionally well with a bowl of sweet strawberries and a dollop of mascarpone cheese. Oh god, so so tasty. I’ve frankly been surprised at the extent to which Montreal is a French city. I’ve always believed that Quebec is more French than the rest of Canada, but I didn’t quite realize the degree. French is the dominant language here, with most people I meet able to drop into English easily. It makes me wish to revisit my two years of high school French. I will readily admit my love for the French way of life and language, and being here in Montreal reminds me deeply of that. The city is very cosmopolitan, very live/work, very European. I’m impressed with it. The weather is also exceptional right now, which I understand is the exception, not the rule. Tonight I’m meeting up with Jason Della Rocca and a large group of game industry folks, for sushi at Wakamono. Sounds tasty!